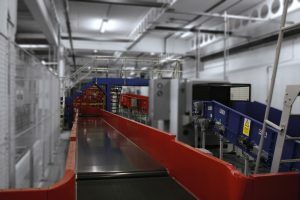 Robson Handling Technology undertake turnkey Airport Baggage Handling Systems, EDS Installation & Integration projects on a worldwide basis. 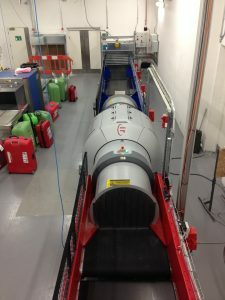 We can undertake projects from the initial feasibility stage right through to full turnkey installation of the Airport Baggage Handling System & EDS Integration. International projects can be done on a full turnkey basis or by providing technical supervision to oversee the installation phase of the project. 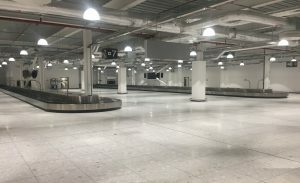 Limited space in airport terminals means innovative airport baggage handling systems are required to ensure passenger baggage throughput can be future proofed whilst maximising retail space for the airport. 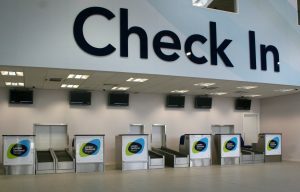 From check in to make-up and through to arrivals, our engineers are some of the most experienced in the airport industry and our airport baggage handling systems are designed to make effective use of the limited space available. Effective design ensures that the final baggage handling system accurately tracks passenger baggage from check in to the aircraft in a time critical manner using state of the art controls. 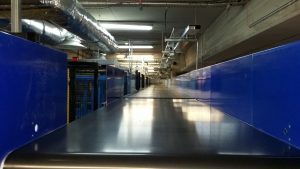 Furthermore the system and the conveying equipment need to be reliable, durable & energy efficient. 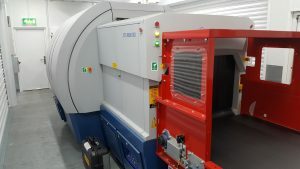 Robson Handling Technology have our own inhouse site installation team who are world leaders working in the demanding live operations environment of an airport. The site installation phasing plans are put together in close co-operation with the airport to minimise disruption to ongoing airport operations. Our teams have extensive experience of EDS installation & integration and have installed EDS machines in some of the tightest spaces possible. With manufacture located in our home of over 100 years in Sheffield, UK, we have an extensive range of baggage handling equipment renowned for quality, reliability & durability. Our expertise is used in some of the busiest airports across the globe including London Heathrow, London Gatwick, Hong Kong International and John F Kennedy. Aesthetically pleasing check-in conveyors weigh, label and despatch baggage, and can be configured in to one, two or three stage check-in arrangements. Separate conveyors are used for the weighing, labelling and despatch of the bags for maximum flexibility. 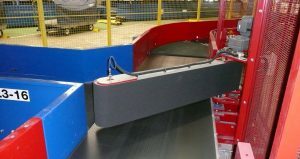 For ease of maintenance the weigh conveyor is mounted on castors, which run in a track fixed to the top of the weigh scale. The castors enable swift replacement of the conveyor with standby units. The conveyor and casing is constructed from a thee pressing slider bed, manufactured using satin finish stainless steel plate x240 grit finish. The belt is a diamond pattern endless belt and runs around terminal pulleys comprising of head & tail pulleys with integral roller bearings. Ultimate for speed, reliability and efficiency, with a range of conveying products to meet the needs of the most challenging of sites and surroundings. Robson Handling Technology Baggage Handling Conveyors are constructed from pressed slider bed using mild steel plate. 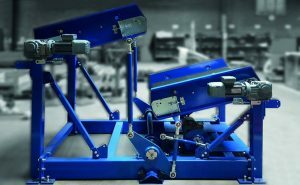 The conveyor casings are jig built to ensure conveyor sections are square and interchangeable. The conveyor tension gear is guarded with painted mild steel plate guards or mesh. All nip points are fitted with painted punched mild steel plate guards. The conveyors are driven by shaft mounted geared motor units complete with torque arm fixings. The conveyor belting is flame retardant in accordance with ISO 340. All drive frames, joint flanges and equipment fixings are fabricated from rolled mild steel flat and pressed sections. Conveyors are supplied with conveyor belts suitable for factory or site vulcanising. Punched mild steel plate to the underside of conveyors (where required) will be hinged on one side and fitted with budget locking devices or mesh under guard. 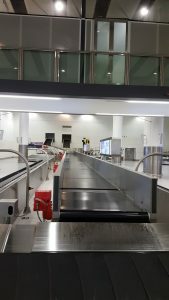 Standard Airport Conveyor Products include: Collector Conveyors Injection Conveyors Receiving Conveyors Queue Conveyors Extended Queue Conveyors Standard Conveyors. 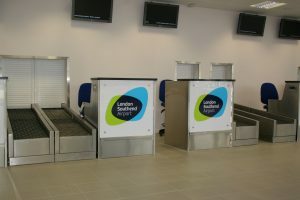 An endless surface which baggage can be displayed prior to reclaim, robustly constructed, flexible in design delivering maximum safety and user-friendly features. The Carousel provides an endless surface which baggage can be displayed prior to reclaim. A combination of straight and radius sections gives the Robson carousel the flexibility to form different types of shapes such as T, U, O, L most shapes can be accommodated depending on available space. The Robson Carousel is quieter than standard carousels to improve the passenger environment. The tow chain is BiPlaner’ type allowing articulation in both the horizontal and vertical planes and is made from a high-density polymer for strength. 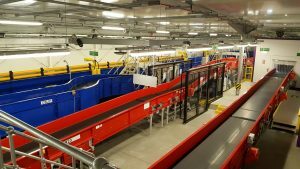 With a nominal speed of 0.45 metres per second and having all fixings internal to the casing resulting with no protruding items plus integral Kick Plates, the Robson Airport Baggage Handling Carousel ensures the safety of all users, Baggage Handlers or Passengers. The conveying surface comprises of overlapping flexible rubber slats, supported on the underside by steel carriers, this gives a user-friendly surface that eliminates finger traps, whist having a strong support able to withstand heavy luggage. 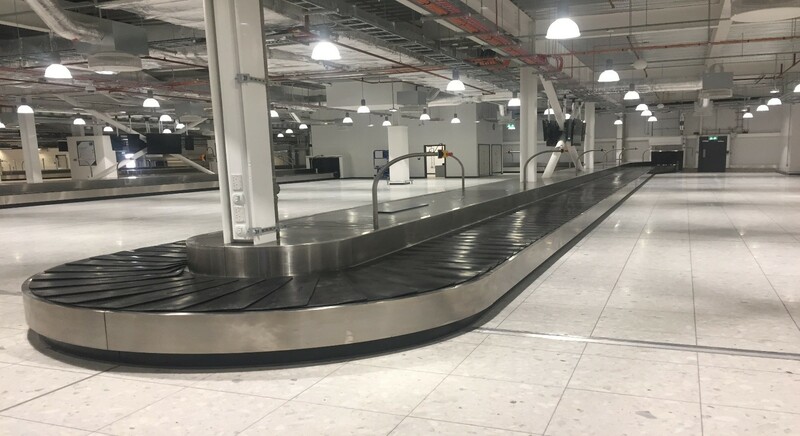 With a choice of finishing materials, the Robson Airport Baggage Handling Carousel is ideal for Land Side or Air Side service. RJD Engineering, celebrating 50 years of excellence! 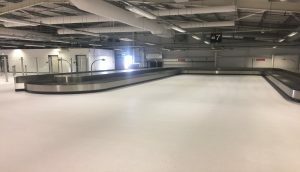 New Robson Handling Technology Arrivals Carousels have been installed at Edinburgh Airport as part of the airport expansion project.